Sold a copy of this card today. The river won’t look like this for a couple of months. It’s that in-between time now. It’s no longer fall, but it isn’t really winter yet. Yesterday, we walked along the Redlands Canal down to Connected Lakes State Park. Golden leaves, formerly in the trees, were on the walkway. There wasn’t much water in the canal either, but there were ducks. We even saw a wood duck. They are not very common around here. 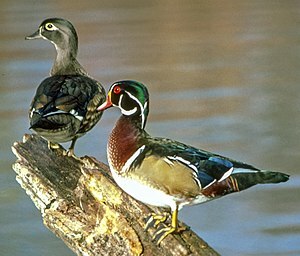 The wood duck picture above was taken by somebody else and shared through Wikipedia. It was really cloudy and getting dark, so I didn’t have my camera. We didn’t see the female, just the male. Colorado River in Winter Post Cards from Zazzle.com. Oh, boy, I can already tell I’m going to learn a lot here on your blog! Thanks for visiting mine so I could find you. 🙂 I can see that I’ll enjoy following and getting to know you and your work very much. Happy Thanksgiving!